An ongoing flow of beverages, including lots of water that is easy to acquire, and drink – don’t force guests to have to ask for water, or put them in a position that they have to find their own glass and use your sink. Dim all the lights. All of them. If you have dimmers, it is likely that someone will bump it or move it, stay on top of this and keep the lights low. 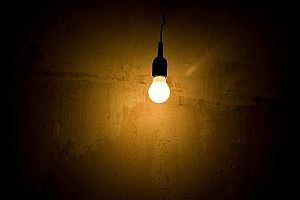 One easy way to avoid cafeteria lighting is to temporarily install 25-watt bulbs in lamps and lighting throughout your home, and/or completely remove a bulb or two from multi-bulb lights. This is especially important in the bathroom. The goal is to have task lighting near your food, and consistent dim lighting everywhere else your guests will be. Empty all of the trashcans, then put one foot-long piece of toilet paper in each bathroom trashcan, and one paper towel in the kitchen/common area trashcans. This allows people to throw away trash without their unmentionables being the only thing in the can. Open all containers of food, and chip clip them so you are not opening new packages in front of guests making them felt like you had to open it just for them. This is especially helpful when you have overnight guests or babysitters. People typically will not open a bag of chips, even you tell them to. If you hold back some food, open it before bringing it to the table. Have several empty trash containers hidden away and ready to go, and bring them in as needed. Instead of making a big ruckus emptying the trash mid party, simply swap out the full containers for empty, or move the full cans aside and bring in empty containers. Makes sure there are spare rolls of toilet paper in each bathroom, and make sure it is visible from the toilet seat. A small decorative basket can sometimes be placed nearby with some toilet tissue in it, if counter space is limited. Put medications and personal items in a basket, and hide them in your bedroom. You cannot assume everyone at your party is rational and trustworthy. You do not want a child or teen sampling your medicine. In addition, it is no one’s business what kind of medical regimen you or a family member are on. Place food on tables throughout your home, and arrange chairs into small groupings near the food. Have napkins and plates in various areas. Also, have a few boxes of tissues available throughout your home. Serve in waves. Keep a flow of food coming throughout the night. If you are cooking on a grill, bring the meat out in small batches, several times throughout the evening, or at least two times. If you use porches or patios, have enough lighting, but not floodlights unless absolutely necessary for safety reasons. Have music playing in bathrooms, if possible, and in areas where you want people to gather. Adjust the volume so it flows as you move from room to room. You can use a TV as a radio, and rechargeable iPod docking speakers are inexpensive and can go anywhere, including the outdoors. The music doesn’t have to be the same. Adjust it so it does not “overlap” but you can hear it when you are nearby. The music should sound a little too loud for the first hour or so, as people arrive… but it will level out as more people begin enjoying your comfortable home! ALWAYS have music playing during a party. Do whatever it takes. Seating is important. Do not leave fancy pillows on sofas, love seats, or chairs. Make room for your guests and don’t force them to have to rearrange your furniture in order to sit down. Use ottomans as tables, or additional seating. Small stools are great and versatile for use as tables or as seating. Have enough seats for about 75% of your guests. If you are serving a sit-down meal, you will need seating for everyone, but you can most likely clear or stack some of the seating once everyone has eaten the main course. Introduce your guests to each other throughout the evening, and include how you know the person. “Rita, this is my friend Dave. Dave helps me run my business; he’s an accountant, and I’ve known Rita since the fourth grade.” Now Dave and Rita have things to talk about, right away. Do not use anything you would miss if it broke. I know… you really want to bust out your fancy stuff, and you can, as long as you are willing to accept the fact that it might get ruined, lost, or it might break. If you can handle that with a smile on your face, go for it. *Tip: Treating your family members like guests can create a special, warm environment for everyone involved. Just because you are related doesn’t mean your “guests” don’t want to look good (dim lighting), feel good (place to sit), enjoy some ambiance (music), and snack to their heart’s content (flowing food). Give it a try. Thank you for reading House Party Tips!